The Current Economy: Green Shoots or Brown Ones? I was listening to an interview with Tim Geithner this weekend, and after going through his (highly readable) new book, they asked him where he thought the economy was headed. “I don’t believe forecasts,” he said, which sounded smart to me (he then proceeded to forecast). –Europe and China have various issues but they won’t shave much off of us. I think there’s virtue in all of these but I’m still less bullish, by which I mean I’m still worried that we slog along at trend, without closing output gaps nearly fast enough, if at all. I think some strong negatives are at work as well, which I’ll elaborate in a moment. First, let’s look at a few of the positive claims above, using some typically excellent slides from GS researchers. The most important, by my lights, is the absence of the fiscal headwinds that smacked the heck out of 2013. The figure below reveals the fiscal impact of taxes and spending to be largely neutral this year (part of that spending is ACA related, btw). Yes, an economically smart public policy would apply stimulative fiscal policy right now, but remember: the key variable here is “fiscal impulse,” the difference in this year’s fiscal position and last years. It that regard, the “do-no-harm” bars for 2014 are a big, important improvement over 2013. Second, a significant factor driving certain positive forecasts in recent years is pent-up demand for household formation. 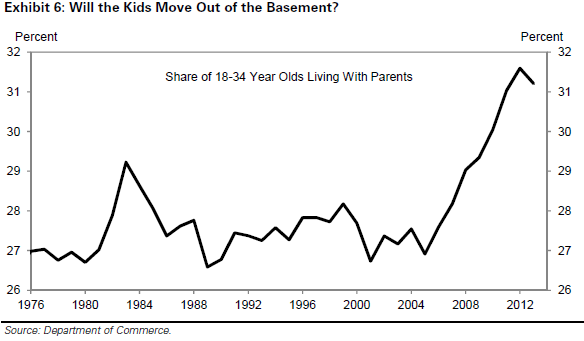 This next figure shows the huge spike in household-formation-aged adults bunking with the ‘rents. It’s at least twice its level relative to the early 80s downturn, though note the slight downturn at the end. So, optimists look at this and figure—not unreasonably—that what goes this far up must come down, leading to more activity in housing and all the downstream economic action that entails. –By various measures, the housing market has stumbled. Both supply (starts, sales of existing homes) and demand (price growth, mortgage applications) are down or decelerated. Moreover, the stumble looks to me to be intimately related to the pretty sudden and sharp rise in mortgage rates that occurred about a year ago, on the heels of the “taper tantrum,” in tandem with the fact that credit access remains limited. There’s a regional dimension to this, as some markets remain strong, but that’s a hint too: those regions look to me to be the ones with more income and job growth. —Labor market slack: it’s improving and steady payroll job gains are a plus. But the 6.3% print on the unemployment rate is biased down due to weak labor force participation such that there’s little pressure in the job market that would enforce a more equitable distribution of earnings. –Which raises another negative: inequality. I’ve written that it’s hard to find convincing evidence that high and rising income inequality hurts longer-term growth through the predicted consumer demand channel (the idea that in a 70% consumption economy, if most of the growth goes to households with relative low spending propensities, growth should slow). But that’s in no small part because the bottom 90% offset their stagnant incomes with leveraging and a housing-inspired wealth effect. Neither of those offsets are particularly operative right now. –Speaking of leveraging, all the data series I know of on this show two things, but the optimists look at only one of them. They show that households are deleveraged, i.e., leverage indices are back to pre-recession levels or below. But they don’t show, at least as far as I’ve seen, any inflection point implying that the deleveraging cycle is over. Absent that, I’d be cautious reading too much into the first point re levels. –Finally, “hysteresis,” the phenomenon of cyclical weakness morphing into structural weakness. I’ve got a very interesting piece on this coming out soon, if I may say so, and it shows the damage done to the growth rates on both our own and many other economies by the great recession and the series policy mistakes made in its wake. Not trying to be the skunk at the garden party here. Just trying to keep it real and not lean too far over the skies as we glide over alleged green shoots that turn brown in the time it takes for a head fake (ouch! !—see what happens when you’re over-caffeinated?!). Share the post "The Current Economy: Green Shoots or Brown Ones?" 9 comments in reply to "The Current Economy: Green Shoots or Brown Ones?" Here in the center of the country the economy has improved but is still faltering at best. Excepting a few pockets of activity housing prices are sluggish and new construction very light. Why is it the Very Smart People have so much trouble understanding that the “national economy” is really a construct of many regional economies, and those regions are very very different? Is it just easier to speak and write in national statistics? “Will the kids move out of the basement?”…no. Many are not living in the basement, the parents are. Formerly middle class folks realized their children had no chance at wealth accumulation unless they could own housing, so many of us enabled them and we took the hit. Now we live happily in the basement as moderators, babysitters and financial backstoppers. I agree with Dean Baker, there is a new normal in housing that is being overlooked. It will continue to contribute less to GDP as the BBers pass on. The only possible green shoot I see is reducing income inequality…not politically feasible. Watch out for the “head fake” , the sky may be falling. (Now that’s a mixed metaphor). But, Dr. Bernstein, you are not yet ready to utter the “R” word, correct? Definitely not! I’m ready to mention the S word: slog. Below is a refutation of Geithner on four of his six points. 3) The output gap, would be without the recession, is further out of reach. The output gap when you look at the graph below is the the gap of 2% normal growth missing in ’08 and ’09, plus the decline of 3% experienced mostly in ’09, plus a smaller amount from increases not compounded from a higher base (so it’s minimally 7%). That’s based on just 2% growth, not the 3% of the 1990s. So far, the recovery has made up exactly 0% of that missing 7%. That’s .07 of $17 trillion, or $1.1 trillion. There is fiscal drag even without sequestration, it’s just the insane policy of Republicans and Democrats seems to have moved the bar in what constitutes responsible policy. I am deeply skeptical about the housing data, and personally Geithner’s cheery outlook about the housing market doesn’t hold any water with me whatsoever. Over at nakedcapitalism.com, there is an absolutely brilliant blog post today (by Wolf Richter) about how “Housing Bubble 2.0 is Already Collapsing”. He has some enlightening data suggesting that the so-called ‘housing market’ has primarily been within the top 10% of both income and housing prices: IOW, the middle class section of the housing market is collapsing. (1) I know a really, really smart young Redfin employee and they know their business – I trust their data. That company tracks data, and they have the technology setup to do it. (2) Last weekend, visiting a friend in her new home in a new subdivision in a suburb east of Seattle (in the tech corridor), I observed that her neighborhood appears to be a microcosm of global demographics: the Chakrabotty’s next to the Li’s, next to the Jones’, etc. She happened to mention that it seems most of her neighbors have paid cash for their homes (prices *start* around $750,000), probably from ‘cashing out stock options’. Ho hum. Then she went on to say that her realtor had advised her that ‘unless you have cash, don’t even bother trying to buy a house in [another trendy eastside Seattle suburb].” I don’t claim this anecdote is true of the larger nation, but it certainly synchs with Wolf Richter’s post on the collapse of the middle class housing market, whereas the top end is booming. (3) After visiting with my friend, I stopped to check on my Ancient Father, who lives in a (very comfortable) retirement home. The staff there are absolutely wonderful, and our family is grateful to them all. But I don’t think a single one of the cooks, servers, desk staff, or anyone not in management would be able to purchase a house within a reasonable commute of the facility. My WWII Vet Ancient Father certainly did not go off to fight Hitler in order for the world to be safe for TBTF banks, nor for the people who feed, shower, and dress him to take it on the chin financially and end up as renters forever, no matter how hard they work. More evidence, IMVHO, of a two-tiered society. And FWIW, from what I see, those employees in the retirement home work at least as hard as any Wall Street banker, for absolutely none of the perks. Geithner’s decision to ‘foam the runway’ and lookout for banks, rather than homeowners, is having some very long term, negative consequences. At least, for the middle class. Unless we have policymakers who spend a lot more time in day care centers, hospice facilities, and retirement communities, I have a horrible feeling that we have people in policy positions who spend far too much time in academic and office settings, and far too little seeing how hard many Americans actually w-o-r-k. This guy gets way too much respect. He’s basically a dull, narrow minded suit. He was against anything that might have helped. He was for bailouts, period. What was good for Wall St was good enough. And more than anybody else, he had Obama’s ear for four years. That tells you something. Oh brother. It was actually only two years and he worked for Biden. Everyone knows Obama only listened to the Geithner’s and Summers’ of the world, so take your bomb throwing somewhere else. 2013 – QE in full swing, economy grows modestly in spite of significant fiscal drag. 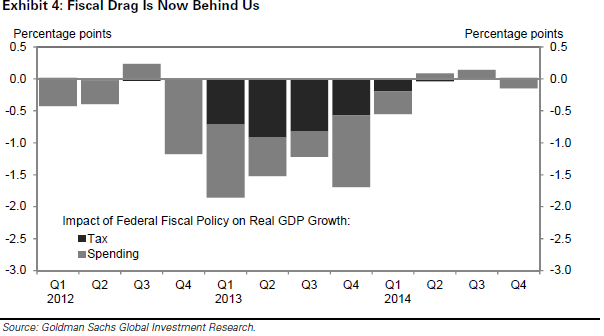 Q1-2014 – the Taper commences while fiscal drag is much reduced and the economy shrinks. Monetary policy trumps fiscal policy, perhaps?